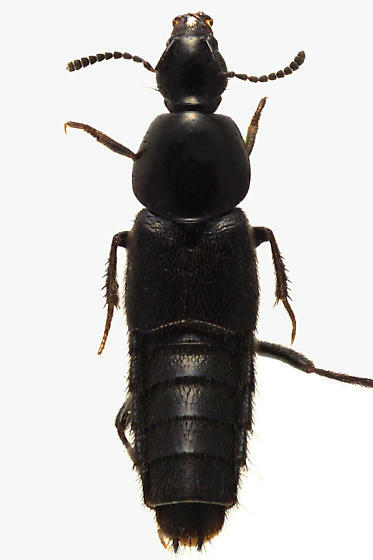 Acylophorus pratensis, copyright Richard Migneault. Contains: Amblyopinina, Cyrtoquediina, Indoquedius, Quedius, Philonthina, Staphylinina. The Staphylinini are a cosmopolitan group of relatively large staphylinid beetles, including the rove beetles that are the most familiar members of the family. A major clade within the group has been referred to as the 'Staphylinini propria', members of which are often distinguished by a dorsal basal ridge on the head capsule, a complete fusion of the pronotum and prosternum inside the procoxal cavity, and a transverse ridge on the hind coxa (Brunke et al. 2016).